Personal Interview Tips: Why body language is observed in PI? Why body language is observed in PI? Why body language is observed in Personal Interview (PI)? When you are interacting with someone, both verbal and non-verbal communication is given importance. The verbal communication is all about the content whereas the non-verbal communication is about the body language and eye contact. Non-verbal communication is important because it enhances one’s verbal communication – imagine a person talking to you without looking at you, how would you feel? You would feel that he is not giving you much importance. This is the reason why students are advised to pay attention to their body language when they enter an interview room for MBA admission. If you maintain a good posture and sit straight, it shows that you are alert and that you are interested in gaining admission into the MBA institute; on the other hand, if you slouch in the chair, you will be indicating to the interviewer that you are not interested in the school or an MBA degree. This is one of the reasons why interviewers observe the body language of the candidate. Generally, students join MBA institutes to go into management positions at a later stage. So, it is important that you behave in a professional manner. Maintain eye contact with your interviewers and ensure that your hand gestures complement your words. This way, you will also gain the interest of your audience. 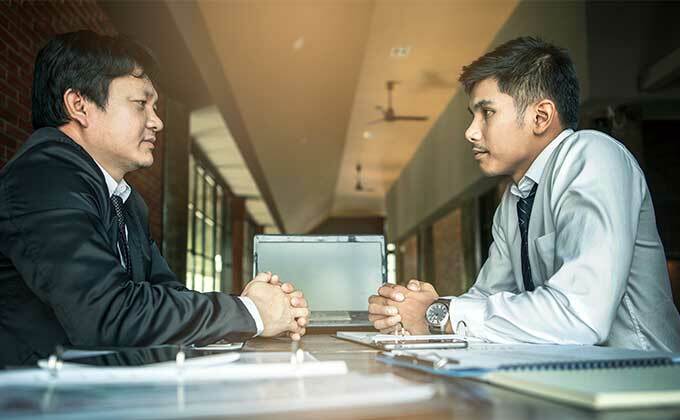 In the MBA institute, you will be groomed into a business leader; but before joining the MBA institute, the interviewers want to be sure if you have the potential to become a business leader. When you enter the interview room, be sure to give a firm handshake to the interviewer. Also, exude confidence while walking or talking. These are not just interview etiquette but basic etiquette that should be followed at all time. Once you sit straight, maintain eye contact, and complement your speech with the right hand gestures, the interviewers will have a positive impression of you and you will have a higher chance of acing the interview.